About 50 villagers who live near railway lines in Phnom Penh gathered outside the Asian Development Bank yesterday morning to again demand more detailed information about what will happen to them during forthcoming phases of a bank-funded railway rehabilitation project. Long Chandy, who represents the Tuol Sangke (B) community in Russey Keo district, said families feared further project phases will require them to vacate their homes. Phase one of the project will affect villagers within 3.5 metres of the tracks. Chandy said villagers had seen documents saying families living within 20 metres of the lines would be affected in further phases. 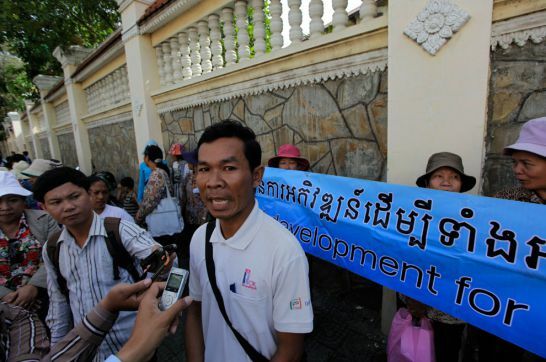 Phnom Penh families who face losing a part of their land to a railway rehabilitation project being funded primarily by the Asian Development Bank (ADB) protested in front of the bank’s country headquarters Monday over what they say has been a lack of transparency about their fate. They said a brief meeting with Country director Eric Sidgwick left them still in the dark. The $143 million project, which has run out of money with much of the work unfinished, has already forced hundreds of families out of their old homes along the country’s railway tracks in several provinces. The families have been resettled to distant and ill-equipped sites. The roughly 100 men, women and children who joined Monday’s protest came from 165 families along a stretch of track in Phnom Penh’s Tuol Kok district who will not have to move their homes, but will likely have to give up a part of their land for a right-of-way. The families say they have received few details and conflicting information about just how much land they will have to give up. In a list of questions they gave the bank on August 4, they also wanted to know the exact schedule of work, the identities of all investors and their responsibilities, among other queries. An ADB representative who briefly came out to meet the protesters told them that Mr. Sidgwick was out of the country. Not long afterward, however, four representatives were ushered into the compound for a brief meeting with Mr. Sidgwick himself, said Ms. Sandos, who joined the meeting. She said the country director did not answer any of their questions but offered to get back to them if he got additional information. Though the families have no titles to the land, they say they have been living by the tracks for years or decades and have documents proving their residency endorsed by local authorities. In a letter to the families dated Friday, Mr. Sidgwick claims that the Finance Ministry’s Resettlement Department would have to answer their questions because it was in charge of the project’s resettlement program, even though this particular group of families is not facing resettlement.